Young Achan Cham dreams of serving in the Kingsguard Knights, but he is a stray—worse than a slave—and such aspirations are out of his reach. Worse, Achan is beginning to hear strange voices in his head. 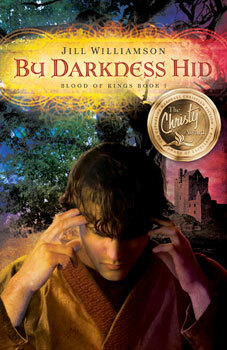 Book 1 in the Blood of Kings fantasy series by Jill Williamson. Young Achan Cham dreams of serving in the Kingsguard Knights, but he is a stray—worse than a slave—and such aspirations are out of his reach. Worse, Achan is beginning to hear strange voices in his head, and wondering why his masters force him to drink a tonic every day, though he is not sick. Half the land of Er’Rets is permanently shrouded in Darkness. Forces on both sides of the Evenwall want Vrell and Achan, and their powerful gifts. This is a terrific fantasy adventure with romance, betrayal, cruelty, and unexpected hope. Because above all the other voices in Achan’s head, he hears a new one calling him to faith. Book 1 in the Blood of Kings fantasy series. I am really looking forward to reading the last book of this series; I’ve read the first two, and have been impatiently awaiting the final installment. In spite of an overabundance (in my opinion) of focus on “slime”, (i.e., the real stuff one finds in stagnant ponds and gutters, not the ‘fun’ type pioneered by Nick*******), these books are of my favorite type: long, epic, and meaningful. Although there IS romance, it is of the *real* variety, not the trumped up, live-happily-ever-after-much-physical-intimacy type. Clean–as in squeaky-clean-but-not-dumbed-down, riveting action, a meaningful and intriguing conflict of dark and light, and a setting in another world in an age not unlike our medieval times, older children and adults will enjoy reading this for themselves, while younger children will enjoy having it read to them. Without being boring or preachy, this series also gives plenty of discussion material for families who read and discuss together: subjects such as godly leadership, humility, fighting for the right, and relationships will find abundant fodder here. Well…that was glowing! I hope the last book holds up to it–but I’m sure it will. I encourage you to enjoy this series of books!